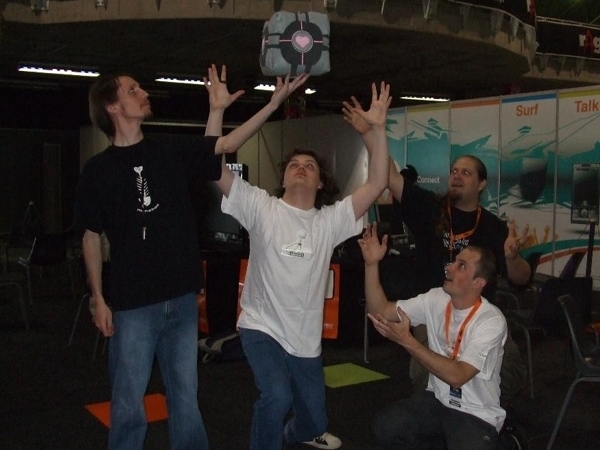 Every year the Really Awesome Gaming Expo (known as rAge by close friends and relatives), held at the Coca Cola Dome in Johannesburg, acts as an undeniable and almost irresistible force, drawing in gamers and game developers alike from all over South Africa and some parts of the Rest of the World™. Naturally, this can only mean a weekend of pure pulsating joy, happiness and companion cubes that cannot possibly be expressed in any number of words. We’ll do it in pictures instead. This peculiarly cube-shaped and particularly huggable object has little to nothing to do with game developing at all. Happily it found itself at the Game.Dev stand (seen in the rear of the photo) and, seeing that it was filled with love and hugs, decided to stay. Card games are inherently fascinating, with chance and strategy being intermingled in a unique manner during each play. This particular game was no exception and had many of the visitors to the stand hooked within minutes. Although not created by anyone in the Game.Dev community, it was a great way to get everyone thinking about gameplay and card game dynamics. It was also a whole bunch of fun. Winner of the Game.Dev Competition 22 and current entrant of the Game.Dev Competition 23, rAge would have been incomplete without an appearance of this legend in its own right. A four player game, with difficulty ranges and hordes of zombies to deal with, the L4D Card Game quickly stole the spotlight and the hearts of many. If you’ve managed to miss it, you can still download the cards and instructionshere. Or, to be more specific, Apples and making games for the iPhone. The presentation included a brief overviews of tools, APIs and processes that prospective developers would need to be familiar with. After setting the (very interesting and friendly-looking) ground rules, he gave anecdotes that pointed out individual areas of concern or highlighted best practices via experience. This was another non-Game.Dev creation that piqued everyone’s curiosity. Being a two-player game that is rather lengthy, not everyone had a chance to try it, but I’m told the turn-based tactics game set in the Warhammer 40k universe was awesome. I believe them. Another Game.Dev legend attracting attention during the weekend’s madness, top-down action shooterSpaceHack’s randomly generated everything (from the weapons and enemies, to the environment and storyline) proved fun and addictive. Displayed on the massive donated-for-the-weekend LCD screen, the DreamBuildPlay Top 20 finalist knew how to draw the crowds in and get a game development discussion going. Two other non-Game.Dev titles getting some notice at rAge, these remarkable Xbox indie games got a chance on the big screen. More on Spelunky here (not quite on Xbox yet) and Splosion Man here. Placed third in the notorious Game.Dev Comp 22, this stylish crowd-pleaser had everyone talking. Having taken the settings, characters and mechanics of Gears of War 2 and transplanted them into a Final Fantasy-esque JRPG, as per the theme of the competition, GOW2 JRPG was an excellent talking point for inquisitive gamers and wannabe developers alike. Now, of course, we expect Gazza_N to get cracking on his next major RPG project. Being run in an un-conference style, this year’s Game.Dev stand had few lectures. Instead, the Postmortems gave everyone a chance to speak about one of their own games, focusing on what went right, what went wrong and what was learnt during the development process. The idea was for us all to find out what has worked out for others and what lessons we can learn without having to make the same mistakes. Sharing this kind of information in invaluable in the community and really shows the true spirit of giving that this community has. Somehow these three gems managed to avoid being caught on camera and so you’re just going to have to take my word for it: they’re loads of fun, and rather pretty. UQ is an ongoing project, started way back for the Game.Dev Comp 16, that we’re all hoping will soon be finished and available for download on the Xbox. OOTEZ, an entry for the current Game.Dev Comp 23, is already widely available for download. An entry for Game.Dev’s Comp 22, and receiving a special mention in the results, Wormies the Board Game also made its appearance on the last day of rAge. Exhibit K is a lie. ← Where’s our profanity pack, 2D Boy?